We are witnessing the rapid growth of the energy prices and there are expectations that they will continue to grow in the future. Consequently, there is a constant need of energy efficiency improvements that could be achieved by decreasing of energy losses, smart and efficient energy utilization and conservation of energy resources. The water supply systems are large energy consumers. So, the investments in the increasing of their energy efficiency will not only have an economic dimension, but also they could have large positive effect on the environment protection. In this paper, an analysis of the degree of efficient usage of the energy and the appropriate techno-economic analysis of the energy consumption for a real water supply system is presented. Few methods for increasing the energy efficiency of water supply pump stations and an analysis of the potential benefits of this method are proposed and discussed too. The problem of increasing reliability of multi-version software of modern control systems for industrial automation was reduced to a problem of pseudo-Boolean optimization problem of knapsack type. For solving this problem, various methods were suggested. 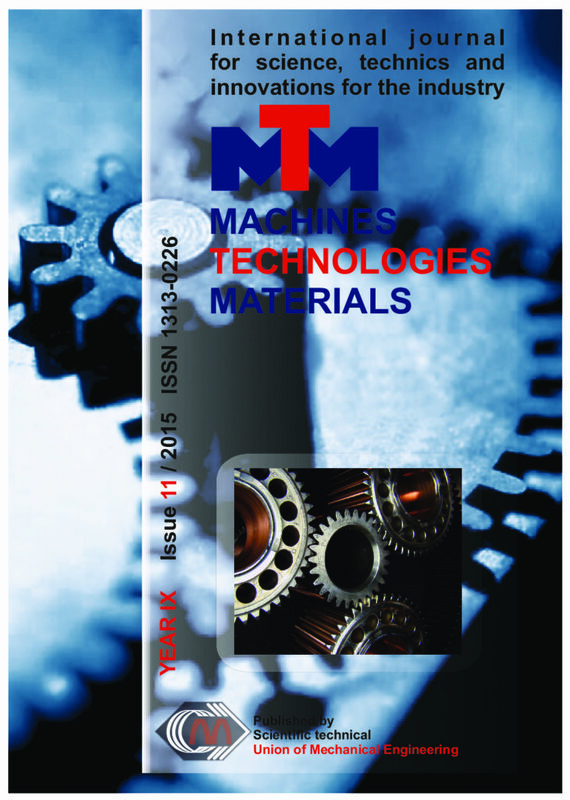 The present article deals with monitoring the changes in the mechanical properties of composites with polymer matrix. The composite was formed from the PA matrix and glass fibers. The composite contains 10 – 30 % glass fibers. The mechanical properties, tensile strength and flexural strength were evaluated on samples of the composite before and after UV radiation on the sample. The largest decline endpoints was recorded in 500 hours of UV exposure. Light microscopy was evaluated distribution of glass fibers in the polymer matrix and the presence of cracks caused by UV radiation. This paper demonstrates a systematic approach for achieving comprehensive mathematical models for electrochemical machining (ECM) of 321-stainless steel based on the response surface methodology (RSM). Machining voltage, tool feed rate, electrolyte flow rate and concentration of NaNO3 solution were considered as the machining parameters while material removal rate (MRR) and surface roughness (Ra) were considered as the process responses. Experimental plan was performed by a central composite design (CCD). The proposed mathematical models statistically have been evaluated by analysis of variance (ANOVA). Analysis shows that the RSM method has been appointed properly as the design of experiments (DOE) method for resolving curvature in ECM process responses. Also, the optimal machining parameter for single optimization of MRR and Ra is determined by desirability function. The results showed that the proposed approach is an effective and suitable way for modeling and optimization of the ECM machining process. In this study hoop tensile properties of continuous fiber reinforced composites pipes are investigated. The test pipes were manufactured of glass fiber and epoxy resin by filament winding method with three different winding angle configurations (10°, 45° and 90°). Three specimens from each model of filament wound pipes with help of split-disk tests were tested and the hoop tensile strengths and modulus of elasticity were determined. From received results it is concluded that, mechanical properties of composite specimens are depended from winding angles in filament winding technology, whereas that bigger winding angle lead to higher hoop tensile properties of filament-wound tubular samples. The optimal values for the hoop tensile strength are obtained for the samples winded with 45° winding angle. The paper considers the issues of qualimetric assessment of quality of reinforced steel. The dependences of the rate group of the mechanical properties from room profile. Built a regression equation characterizing the effects of deformation processing on the quality of rebar. This article provides a way to detect fatigue cracks in welded gearwheel at reinforcement dimensional cutting mechanism (flying shears) of rolling mill by analyzing the direct spectrum of vibration. This method is progressive and allows through regular vibration measurements to assess equipment condition and predict performance. The evaluation of yield stress -σS is frequently encounter in material testing. In this method there is necessity of manufacture of test-tube from tested material or detail and made tension test. There is destructive method. For many details there is not acceptable. In material testing there is interest to non-destructive evaluation of yield stress σS for the materials and details. In this paper is lock at possibility for non-destructive evaluation of yield stress σS by means measure Brinel’s hardness – HB or velocities of propagation of longitudinal and transversal ultrasonic waves – VL and VT in tested materials and details. E-learning, seen in the ergonomic aspect, is a complex and intense human activity that is subject to investigation and analysis in order to optimize it. The quality of education is seen as a trinity of its effectiveness, efficiency and satisfaction – criteria that are defined, studied and assessed using a specially developed, original methodology of the authors. These criteria were used to investigate BA, MA and Ph.D. students in two consecutive years.